Enjoy the beauty, craftsmanship and elegance of the Sterling Silver Heart Shaped Ring with Two Birthstones set and show off your great taste in fine jewelry to the world. Few other rings offer the glitz and glamour of this ring while still keeping all of the comfort and elegance that you want. Made from the finest sterling silver, the ring is comfortable to wear and is available in a number of sizes. 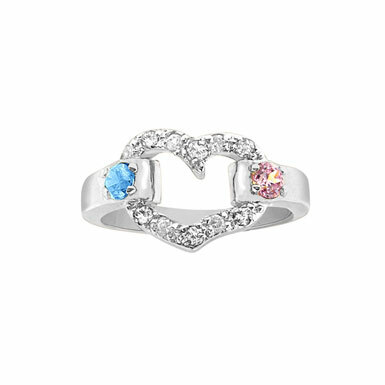 Choose up to two birthstones to set off the heart on either side of the ring. Enjoy the shine of the silver and the sparkle of the birthstones as well as the stunning heart, which is comprised of several small CZ stones. Whether you are looking to add a new piece to your jewelry collection or you are buying for someone else, this is a great ring to have and wear every day! We guarantee our Sterling Silver Heart Shaped Ring with Two Birthstones to be high quality, authentic jewelry, as described above.